It’s a pretty jam packed PS Sore Update this week, anchored by several high-profile full PS3 titles including AC4, Battlefield 4 and WWE 2K14, PSN releases such as Castlevania: Lords of Shadow: Mirror of Fate HD and Proteus, a trio of non game apps, several sale items and more. 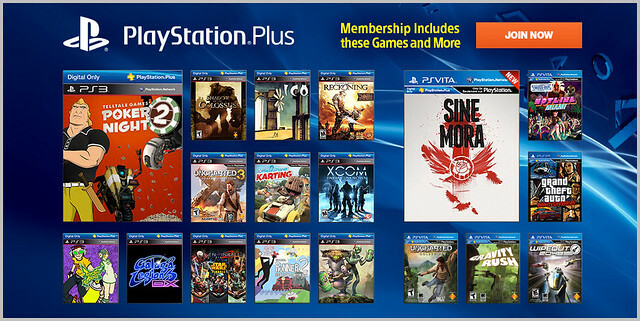 PS Plus subscribers get the awesome Sine Mora for free, so definitely download that. It is 1715. Pirates rule the Caribbean, terrorizing navies & humiliating empires. From sinking warships to conquering fortresses, Captain Edward Kenway stopped at nothing to earn his fortune & legend. Also, Aveline is back with 60 minutes of gameplay – exclusively on PlayStation! Assassin’s Creed 4 Black Flag finds Aveline during a rogue period of self-discovery, unsure of her alliances, but more committed than ever to defending and liberating slaves. It is 1715. Pirates rule the Caribbean, terrorizing navies & humiliating empires. From sinking warships to conquering fortresses, Captain Edward Kenway stopped at nothing to earn his fortune & legend. Yet, the adventures of his first mate have never been revealed. Until now. Get the game & the Season Pass now for the chance to play as Edward’s first mate, who will take you even deeper into the real explosive events of the Golden Age of Pirates. Also, Aveline is back with 60 minutes of gameplay – exclusively on PlayStation®3 System! Assassin’s Creed 4 Black Flag finds Aveline during a rogue period of self-discovery, unsure of her alliances, but more committed than ever to defending and liberating slaves. Battlefield 4 is the genre-defining action blockbuster made of moments that blur the line between game and glory. Fueled by the next-generation power and fidelity of Frostbite™ 3, Battlefield 4 provides a visceral, dramatic experience unlike any other. Join an epic adventure with the Angry Birds in the legendary Star Wars universe, re-mastered for gaming systems! Use the Force, wield your Lightsaber, and blast away Pigtroopers on an intergalactic journey from the deserts of Tatooine to the depths of the Pig Star — where you’ll face off against the terrifying Darth Vader, Dark Lord of the Pigs! Can you become a Jedi Master and restore freedom to the galaxy? May the birds be with you! Dynasty Warriors 6 Empires combines thrilling battle action with strategic conquest! Unite all of China under your banner as a ruler, or fight for honor as a loyal officer. With open-ended gameplay and extensive customization, rewrite history as you like! The year is 1765. While the seeds of the American Revolution are being sewn in Boston and New York, Spanish forces in the South plot to seize control of Louisiana for the Templars, threatening to forever shift the balance of power in the New World. As Templars secretly take hold of the slave trade in New Orleans, Aveline de Grandpré, an assassin of mixed French & African heritage, stands ready to defend her people. She soon finds herself on an unforgettable journey that will take her from the crowded streets of New Orleans to voodoo-haunted swamps and ancient Mayan ruins. Whether eliminating her enemies with new assassination skills or luring them into cunning traps, Aveline strikes mortal fear into the hearts of those who would stand against freedom. Arriving for the first time as a digital title on PlayStation®3, Assassin’s Creed® Liberation HD is the striking chapter of the pre-American Revolution AC saga. Proteus is a game about exploration and immersion in a dream-like island world where the soundtrack is created by your surroundings. The primary means of interaction is simply your presence in the world and how you observe it. Each unique, procedurally generated island is home to shy creatures, tranquil valleys and enchanted ruins. The award winning NBA Game Time app is the official app of the NBA. Get live stats, box scores and schedules for every team and game. Watch top plays from around the league, including video highlights. Watch regular season NBA games all season long with the purchase of NBA league pass broadband. Available on PS3 and PS Vita. With Redbox Instant by Verizon you can, browse & watch movies instantly, reserve new releases at a kiosk, and rent or buy movies digitally on demand. Download now for the PS3 and get a Free Month of Movies! TuneIn lets you listen to the world’s radio with music, sports, news, talk, and comedy streaming from every continent. Enjoy 70,000 live radio stations and 2 million podcasts, concerts or shows all for free. Available on PS3. PS Vita coming soon.